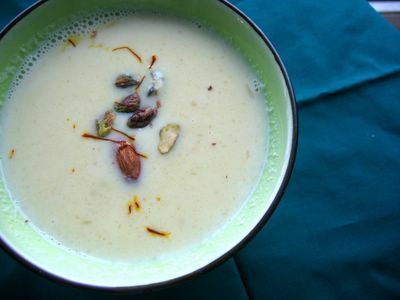 This is a Gujarati dish and it is looked upon with respect for its nutritional value. 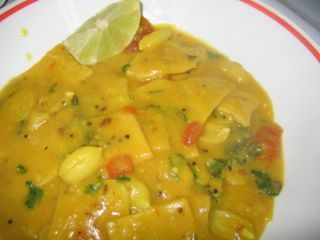 A pot of soupy dal becomes the cooking liquid for semi-cooked spiced roti dumplings. This is a protein dream for vegetarians. You can make it as low-carb as you wish by reducing the amount of roti pieces but then it will be more soupy than saucey. The flour in the dumplings thickens the dal quite a bit and makes it into a saucy pasta-like dish. Using ghee is the way to go for this peasant style dish. As Rachel Ray puts it, when you are low-carbing (even if it is for a day), moderate fat intake is ok, right. Mix whole wheat flour with salt, turmeric powder, red chilli powder, cumin or carom seeds, asafoetida, oil and sufficient water to knead into a hard dough. 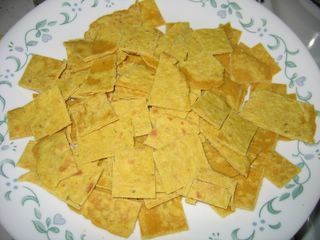 Divide into smaller portions and roll into thin rotis. Roast slightly in a skillet on both sides, till the rotis dry up slightly. Cool and cut them into diamonds or squares. You can also cut this into papparadelle pasta sheets. 1.Wash and cook the dal and peanuts with 1/2 tsp turmeric and sufficient quantity of water. The lentil should turn into a mush when mashed. Mash dal until smooth with peanuts sticking out. 2.Heat the ghee-oil mixture in a saucepan. Add all the tempering ingredients and stir until the mustard seeds splutter. Add the tomatoes, ginger, green chilies and stir for 30 sec. Add 2.5 cups water, sugar, chili powder, remaining turmeric powder, kokum or tamarind paste and simmer for 10 min. 3.Add mashed up lentil mixture and salt. Simmer for another 10 min. 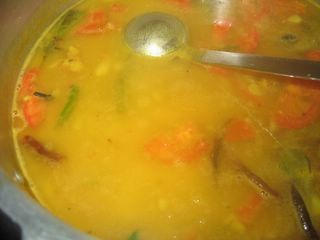 At this point, dal will be very thin like its derivative rasam. About 15 min before serving, bring dal to a boil. Add dhokli pieces, one or two at a time. Simmer for 15 min. If the dal is becoming too thick, before 15 min elapse, add more water. Garnish with chopped cilantro leaves and squeeze the lemon juice. Serve hot as a saucy pasta or serve at room temperature like a more-thickened upma. Thanks to you cilantro recipe. Visit my blog for a note on it. Mika - that sounds delicious! Does it take much time to make the roti?